2016 Domaine Yves Boyer-Martenot, Meursault “Les Chaumes” White Burgundy, France. One of my favorite wines of the vintage, for far, from Burgundy is Vincent Boyer’s Meursault Les Chaumes 2016, it’s a beautiful and layered Chardonnay that in many ways reminds me a bit more of a Grand Cru Corton-Charlemagne than a Meursault, such is the density, complexity and its impressive presence in the glass. I was thrilled to meet Vincent Boyer and spend an evening tasting Burgundy, trying to pick his brain and enjoying the remarkable quality and regal personality of his wines. Boyer, who is visiting from his home in Meursault, enjoying time with friends and checking out the winemaking in the Monterey region, joined our tasting group to do a blind tasting of Burgundy wines, which included a few of his own thrown into the mix, and of the whites, his really stood out, being head and shoulders above the competition on the night, and I my opinion, especially his 2016 Les Chaumes. It was a star studded night with Sam Smith of Morgan Winery and his own Samuel Louis Smith Wines label and Russell Joyce of Joyce Wine Company, who had hosted Vincent at his winery in Salinas, where they sampled some wines from Monterey that impressed the talented Burgundian. Vincent’s Domaine Yves Boyer-Martenot, is mostly known for their great whites, that include a brilliant selection of Meursault and Puligny-Montrachets, but also have a set of reds as well, from Volnay and Pommard. This famous estate made its name after World War II, when André Boyer inherited the Domaine from his mother Lucie, who up until then had been heroically running the winery entirely by herself, in 1945 André married Juliette Devèze, who was born and raised in the adjoining village of Puligny Montrachet, and had a son Yves, who continued his families tradition, taking over the Domaine and it was at this point when it became Boyer-Martenot, as he married Marie Cécile Martenot, the daughter of a winemaker in Meursault. Vincent Boyer their son is now the owner and winemaker of the Domaine, and his efforts has brought the real and current fame to this property that has a elite collection of vines in the chalky soils of the Cote de Beaune. The estate practices sustainable farming, avoiding pesticides and herbicides, and Boyer uses indigenous yeasts for his fermentations. All grape harvesting is exclusively done by hand, with extreme care and selection. Grapes are whole cluster pressed then fermented naturally in temperature-controlled, stainless steel tanks with aging in a mix of older and new French oak barrels (no more than 30% new wood) for about 12 months. According to their importer, the Meursault from Boyer-Martenot today is more expressive than ever, something I would agree with completely from my recent experience. Vincent’s philosophy, according to him, of less-is-more in the cellar means what you experience in each bottle is exactly what each unique vineyard and each perfect grape has to give. The hard working and soil focused Vincent, along with his sister Sylvie who helps him run the estate, has become a treasure of his region, while most Meursault winemakers blend, sites and grapes from different zones within the region, Boyer vinifies and bottles many of his wines from his villages vineyards separately, to highlight unique and individual terroirs and sites, like this Les Chaumes. 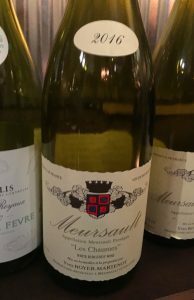 Through his efforts at this estate, these single-vineyard Meursault wines have found their own singular voices, which was amazingly clear in our tasting, showing just how varied and captivating great Meursault(s) can be, even from less known plots. The beautiful and seductive, richly flavored 2016 Les Chaumes comes From the lieu dit ‘Les Chaumes’, which sits directly above the 1er Cru Perrieres and adjacent to Narvaux, with sustainable farmed 35+ year old vines set on clay-limestone soils, and as mention Vincent allowed primary to go with indigenous yeast in tank and used just 10% new oak on this very expressive and full bodied wine without fining or filtration. With layers upon layer this Meursault Les Chaumes starts with a lovely white flowers perfume and with a hint of stony notes as well as delicate toasty elements along with golden/yellow fruits that include apple, apricot, racy citrus and with an array of mineral, clove spice, light hazelnut and white fig. The textural opulence is on par with much more heralded Premier Crus and or Grand Cru wines, making this wine that much more awesome in the glass, while still being gorgeously proportioned and finely balanced with lovely lively acidity adding plenty of pop and adding to the overall feeling of focus and substance in this stellar white Burgundy. I can imagine it getting more interesting with time in the bottle, but honestly it’s fabulous even right now.